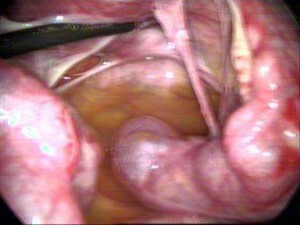 Diagnostic laparoscopy may be recommended to look at the outside of the uterus, fallopian tubes, ovaries, and internal pelvic area. 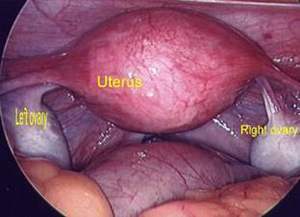 Diagnostic hysteroscopy is used to look inside the uterine cavity. If an abnormal condition is detected during the diagnostic procedure, operative laparoscopy or operative hysteroscopy can often be performed to correct it at the same time, avoiding the need for a second surgery. Both diagnostic and operative procedures should be performed by physicians with surgical expertise in these areas. During operative laparoscopy, many abdominal disorders can be treated safely through the laparoscope at the same time that the diagnosis is made. When performing operative laparoscopy, the physician inserts additional instruments such as probes, scissors, grasping instruments, biopsy forceps, electrosurgical or laser instruments, and suture materials through two or three additional incisions. 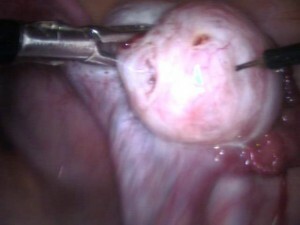 Lasers, while a significant help in certain operations, are expensive and are not necessarily better or more effective than other surgical techniques used during operative laparoscopy. 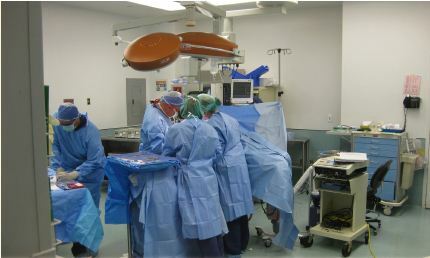 The choice of technique and instruments depends on many factors including the physician’s experience, location of the problem, and availability of equipment. Some problems that can be corrected with operative laparoscopy include removing adhesions (scar tissue)from around the fallopian tubes and ovaries, opening blocked tubes, removing ovarian cysts, and treating ectopic pregnancy. Endometriosis can also be removed or ablated from the outside of the uterus, ovaries or peritoneum. Under certain circumstances, fibroids on the uterus can also be removed. Operative laparoscopy can also be used to remove diseased ovaries and can be performed as part of a hysterectomy. Hysteroscopy is a useful procedure to evaluate women with infertility, recurrent miscarriage, or abnormal uterine bleeding. Diagnostic hysteroscopy is used to examine the uterine cavity and is helpful in diagnosing abnormal uterine conditions such as fibroids protruding into the uterine cavity, scarring, polyps, and congenital malformations. A hysterosalpingogram (an x-ray of the uterus and fallopian tubes), sonohysterogram (ultrasound with introduction of saline into the uterine cavity), or an endometrial biopsy may be performed to evaluate the uterus prior to hysteroscopy. 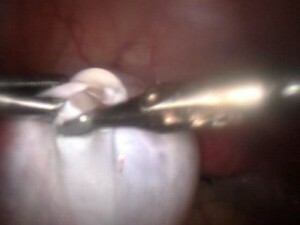 Operative hysteroscopy can treat many of the abnormalities found during diagnostic hysteroscopy. Operative hysteroscopy is similar to diagnostic hysteroscopy except that narrow instruments are placed into the uterine cavity through a channel in the operative hysteroscope. Fibroids, scar tissue, and polyps can be removed from inside the uterus. 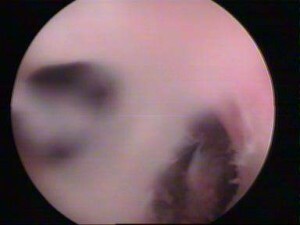 Some structural abnormalities, such as a uterine septum, may be corrected through the hysteroscope.